Lewes FC is delighted to announce the signing of Burgess Hill Town striker Kieron Pamment. 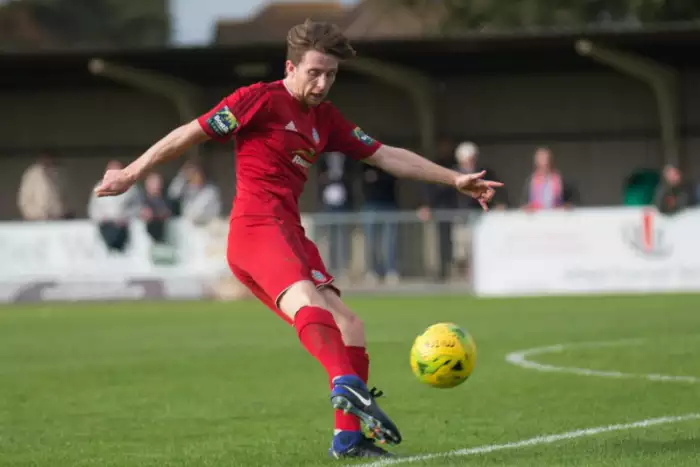 The 25-year-old forward was Worthing’s top scorer with 19 goals last season, and made the switch to Hill in the summer. Darren Freeman has been tracking the player since missing out on his signing in the summer and is happy to have finally landed the forward. “I’m delighted to have signed Kieron,” the gaffer said. “I tried to bring him in at the start of the season. We met and had long talks with him, but he decided to join Burgess Hill. I’m glad we’ve managed to convince him to come across. Kieron is the second new face at the Pan this week, following the loan signing of Henri Wilder from Mansfield Town. Henri made an impressive debut versus Harlow in the week and is providing cover for the injured Leon Redwood. Fellow defender Lloyd Cotton is back in training and working his way back to fitness, following a nasty viral infection. Jack Walder continues to rest his knee, until he gets the go-ahead to resume training from his surgeon. Meanwhile, Darren is happy with yet another youth player breaking through the ranks into the first team squad. Sam Karl waited patiently for his chance after banging in the goals for the Development Squad last season and took it with both hands when he was selected to start against Farnborough in the FA Cup. He’s been in and around the squad ever since and Darren’s impressed with what he’s seen.